Al Habtoor Motors & Chery UAE appoint Priti Malik as the brand ambassador of Chery in the UAE The energetic and ever-popular Dubai based radio jockey, Priti Malik has been appointed as the voice and face of Chery. 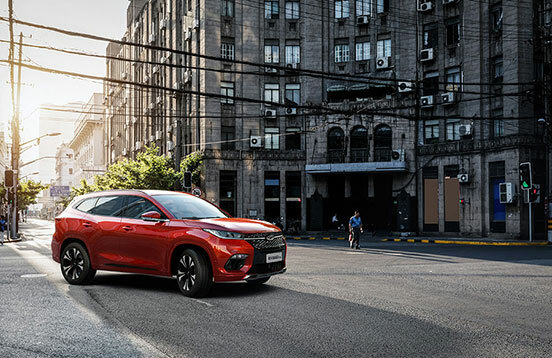 Speaking on her latest role, an excited Priti said "I’m excited to be working with one of China’s hottest brands and connecting with Chery drivers as their brand ambassador." Born to Indian-born parents, Priti was raised in New York, growing up with a balanced exposure of Bollywood films and the Backstreet Boys. Though her original plan was to pursue a career in law, her visit to the MTV studios during her high school years to watch a taping of Total Request Live was a life changer. She decided to embark on a career in Broadcast Journalism and has never looked back. Al Habtoor Motors, the official dealer of Chery in the UAE boasts a nationwide presence and has helped the brand to make great inroads in the UAE's highly competitive automobile sector ever since its launch in 2013. 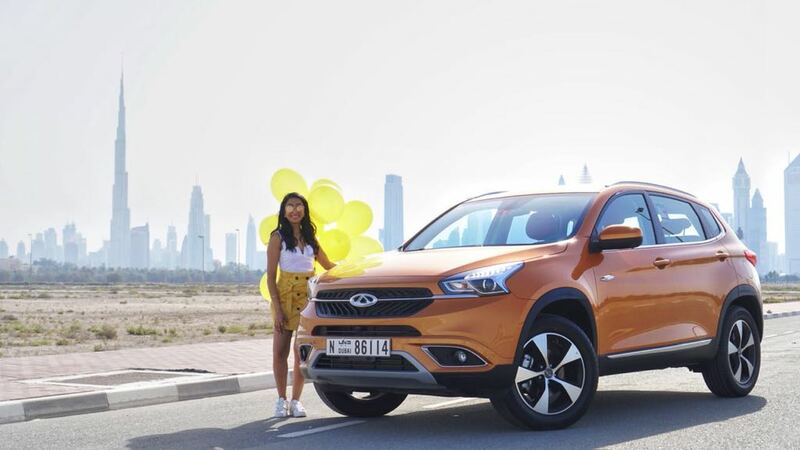 "As a brand built on core value of "Fun to drive" it was only natural to have a colorful and energetic personality like Priti as the brand ambassador, as she embodies the very same youthful vibrancy, fashionable outlook and fun attitude of Chery" said Mr. Nassib Nassar, GM Marketing of Al Habtoor Motors. Based out of Wuhu, Anhui Province, Chery was founded by the Government of China in 1997 as a corporation owned by the state with the main focus of creating world-class passenger cars, minivans, and SUVs. Chery is also the largest passenger car exporter in China for 15 consecutive years with roughly 30% of the total production being exported to the world markets. The company has several factories in China, along with assembly plants in 15 other countries using semi-complete knock-down kits. At the same time, its two JVs own other brands like Jaguar and Land Rover. Today, with a global presence in over 80 countries, Chery is a name synonymous with vehicles that offer a perfect blend of quality, technology and affordability. With its range of successful models like Tiggo7, Tiggo5, Tiggo3, Arrizo3 and Arrizo5, Chery has managed to carve a name for itself in the UAE's vibrant automobile market. Appealing to the Belt & Road Initiative, Chery Put into Operation Its Project in Algeria In 2013, China proposed the Belt & Road Initiative for the first time with great expectations for it, which kicked off the cooperation with countries along the Belt & Road. The Initiative is designed to develop the New Silk Road Economic Belt and 21st Century Maritime Silk Road. By making exchanges with countries along the Belt & China, China hopes to enhance political, economic and cultural fusion with these countries, build a community of shared future, interest and responsibility for Asia, Europe and Africa, and make it an economic belt with greatest potential in the world. Chery Automobile Co., Ltd. (Chery), as the representative of China’s automobile manufacturers, appeals actively to what the government advocates. Chery has exported more than 1.3 million units to 46 of the over 60 countries along the Belt & Road, ranking No. 1 passenger vehicle exporter in China for 15 years in a row. Algeria, as one of the major markets of Chery International, occupies an important position in Chery’s strategy in North African market. It covers a territory of 2,381,741km2 and has population of more than 40 million people At 10:18 a.m. on February 1, 2018, Chery held the ceremony, in container terminal of SINOTRANS Anhui Zhujiaqiao Storage & Transport Co., Ltd. in Wuhu, to celebrate shipping of its KD production line in Algeria. 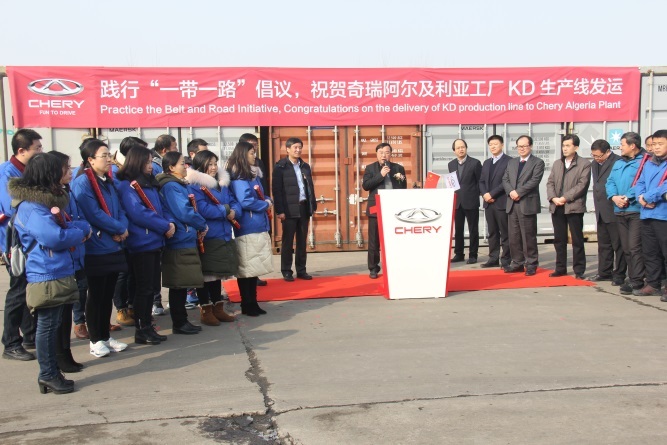 Witnessed by Mr. Pan Yanlong, Chery Vice President and President of Chery International, the KD production line of Chery was embarked on the shipping. The ceremony was also attended by Vice President Fan Duanwei of SINOTRANS & CSC, Vice General Manager Li Jingqiu of SINOTRANS & CSC Operation & Management Department, and General Manager Si Fenghuo of Chery Overseas Investment Corporation, At the ceremony full of passion and excitement, President Pan explained the significance of the KD project, saying Algeria has stable politics, continuously booming economy, and huge market potential. Chery always deems it an integral part of its overseas strategy. Since making debut in Algeria in 2011, Chery has sold nearly 50,000 vehicles in the market. In 2017, Chery and its dealers in Algeria were active to respond to the new automotive industry policies issued by Algeria government. 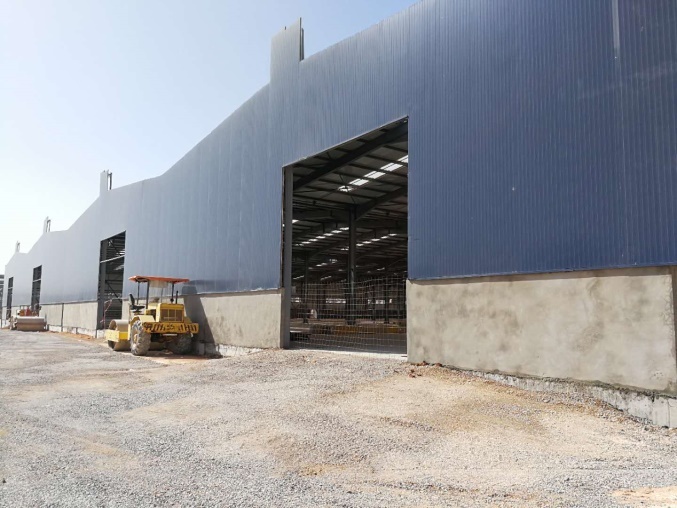 It has set up factory in SETIF of Algeria. 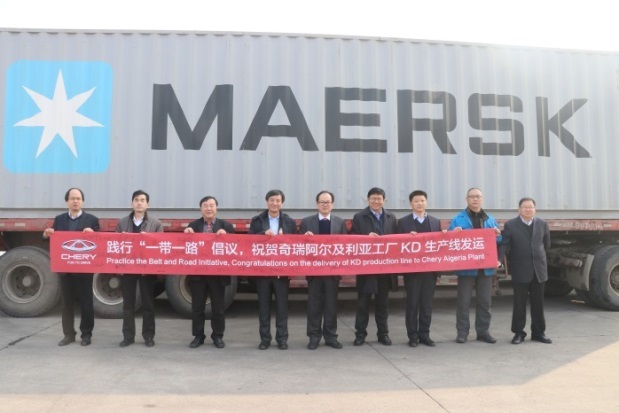 The ceremony celebrated the shipping of some production and testing equipment for the factory. We are confident that, as the production line is put into operation in the brand’s factory in SETIF, Chery will not only provide the most satisfying products for local consumers, but also bring values to them. At the same time, we also hope that Chery will make its contributions to automotive industry in the country by supporting automotive technologies, equipment and professional training in Algeria. 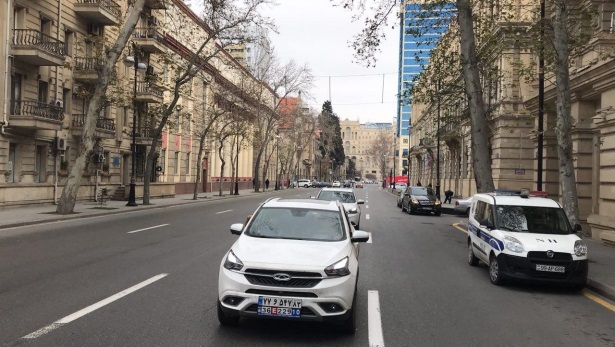 TIGGO7 Conquers Azerbaijan, Chery Carries Quality Through In mid-January 2018, the cross-border self-driving tour held by Chery club in Iran started in Tehran grandly. A motorcade consisted of 10 TIGGO7 drove northward all the way to Baku, capital of Azerbaijan, through Tabriz. The whole journey was more than 3,000 kilometers, including all kinds of road conditions such as snowfield, mountain road, etc. Chery proved its strength through a zero-failure journey. The cross-border tour this time shown the performance of TIGGO7 incisively and vividly. TIGGO7 is equipped with 1.5T+6DCT power unit, excellent gearbox and engine tunning, as well as a ground clearance of 210mm and a wading depth of 0.6M, which endow the vehicle with so strong a passage capacity that it can travel over land and water, plain and snowfield with skill and ease. TIGGO7 uses the second generation of electric power steering system, which makes the steering wheel accurate and convenient, the feedback strength steady and the response outstanding. At the same time, TIGGO7 pays great attention to shock-absorbing, as a four-wheel independent suspension structure of Mcpherson in the front and four-link in the rear is adopted. Box subframes are equipped both in the front and the rear. And the two-channel shock-absorbing design makes the vehicle smoother on control and steadier in rampways. The importance of driving safety is self-evident. The responsibility to both consumers and ourselves is expressed in the safety equipment. TIGGO7 which is designed as per C-NCAP five-star safety standard provides considerate protection for the free driving of consumers. TIGGO7 is equipped with integrated cage car body, 6D stringer frame structure and passive safety of 6-air bag safety protection; The series is equipped with ESP (Electronic Stability Program) and 360° full-time panoramic image and super-short braking distance of 39.70m in 100km/h, which comprehensively improve the stability and safety of the vehicle to safeguard the free driving pleasure of consumers. The superior product with beautiful look both inside and outside is the one giving consideration to both hard and soft. In the driving course, the vehicle performs well in filtering road noise and wind noise to provide a great driving environment for the driver. 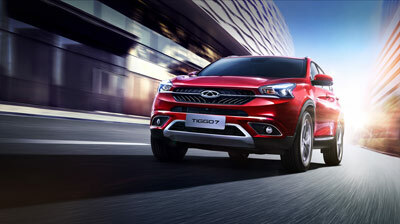 To remove some consumers’ fear to “hill-start”, TIGGO7 is equipped with hill-start auxiliary system. Any driver could work leisurely in hill-start just like on the level road. 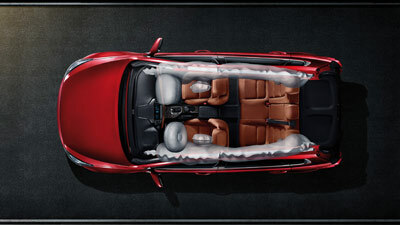 Besides, TIGGO7 selects high-quality perforated leather seats, which, combined with dual-zone air conditioning and front-row seat heating function, conveys warmness from Chery to clients sincerely. While the journey is long, the 092m2 panoramic sunroof turns it into an enjoyment since everything looks great from the sunroof. Iran is one of the overseas strategic markets of Chery. 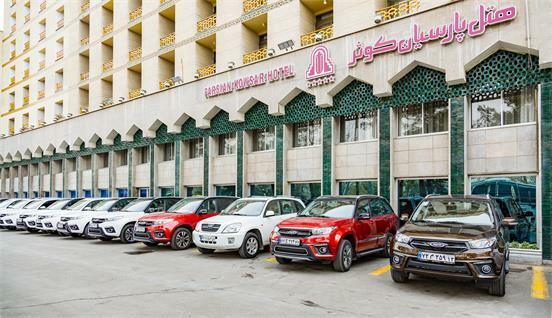 Through years of development, Chery MVM has developed into the first foreign-funded automobile enterprise in Iran. Its products are well accepted and favored by consumers in Iran and its car parc surpasses 300,000. In the future, Chery will bring higher-end, more intelligent and more environmentally friendly products to Iran and even the world to build scientific and smart mobile life for users in the whole world. Win the Honor of Best "Employer" Again Chery has won "TOP 100 Best Employer in 2017" A few days ago, on the award ceremony of 2017 "Best Employer" sponsored by dajie.com, the domestic famous mobile social contact recruitment platform exclusive to the young people, Chery stood out from 1.6 million enterprises and entered "Top 100 Best Employer in 2017" with the comprehensive strength of the brand successfully. This is the second time for Chery to win the honor of best "Employer" after it was successfully selected into "Top 100 Best Employer in 2017 of China". Dajie.com, as a recruitment website, mainly matches the best working opportunity for the young working people, expands their career interpersonal connections, improves the career value, and serves the recruitment industry through the internet thought and the mode of subverting the recruitment industry, which has a great influence on the young people. "Best Employer" is the only employer appraisal competition in our country that connects the dialogue approach between employers and employees sponsored by dajie.com. In this appraisal, the sponsor adopted the employer 4C index as the judgment condition for the first time, showed the employer brand value by data quantization to select the premium employer in a broad manner, and adopted appraisal sections such as simultaneous voting of multiple ports' linkage and offline evaluation of hundred-people delegation for the best employer. 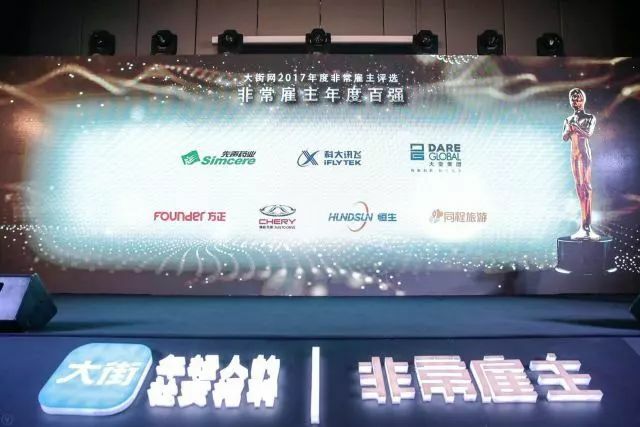 The sponsor dajie.com finally selected the list of best employers from more than 3,000 companies based on the evaluation of 50 million businessmen and the annual employer brand effect of 1.6 million enterprises. That Chery can top the list of "Best Employer" from the strict appraisal should not be separated from the good corporate cultural atmosphere and talent mechanism. Since the beginning of establishment, Chery has been devoted to creating the real internationally first-rate brand, and regarded talents as the first impetus of corporate development by sticking to the talent concept of "being people-oriented, open and tolerant". It sticks to the employment mechanism of "retaining people with sincere emotions, attracting people with wonderful career, training people with tough work, cultivating people with effective learning, motivating people with reasonable system" and makes Chery be the best employer in the eyes of employees, so that many talented people find the broad platform of realizing their own values. It is called as the "Huangpu Military Academy" in the Chinese automobile industry by many people amiably. While providing the reasonable and competitive growth space and platform for employees, Chery tries to create a good corporate culture, create the atmosphere of respecting employees and keep perfecting the welfare treatment. For example, it establishes the differentiated talent reward salary system in terms of the welfare policies such as salary incentive, retention mechanism and children' education. Strengthen talents' concern and participation in the long-term development of enterprises. International talent team of Chery For a long time, talents have been the important part of the "fundamental resources" of enterprises and become the "chip" of corporate competition. The good talent mechanism allows Chery to attract the global elite talents. Meanwhile, it also lays the foundation for the formation of the good reputation of enterprise and modeling of the employer brand. At present, Chery has formed a R&D team composed of 3,500 persons. 300 of them are the high-level talents from Europe, the United States, Japan and South Korea. There are also more than 680 masters and doctors and 16 experts have been selected into the national "Recruitment Program of Global Experts". Chery has realized the interaction among advanced technologies, flow and talent resources through introducing the international high-end talents. It has also formed a young, international and diversified talent echelon, which provides the vitality for Chery's technical R&D and deepening of international strategic layout. As is introduced by related responsible person of human resources of Chery, in recent years, Chery has been placing talent strategy in the important position and has set up a whole set of strategic human resource system, including talent introduction and retention, employee development and cultivation, salary incentive and evaluation. In order to promote the synchronous development of employees and the enterprise, Chery has divided all the employees into three series, including administrative management, specialized technique and technical worker. It also has designed three growth and promotion routes respectively, so as to stimulate the learning and grow-up of employees. Meanwhile, it takes advantage of the resource advantages of the two joint venture brands including QOROS and Chery Jaguar Land Rover to promote talent exchange and keep enriching the "talent pool" of "Big Chery". It is exactly the competitive salary welfare and individual development system that makes Chery people be devoted into work with the active working enthusiasm and limitless creative vitality, which not only promotes the individual working efficiency and the pace of moving forward of the enterprise. 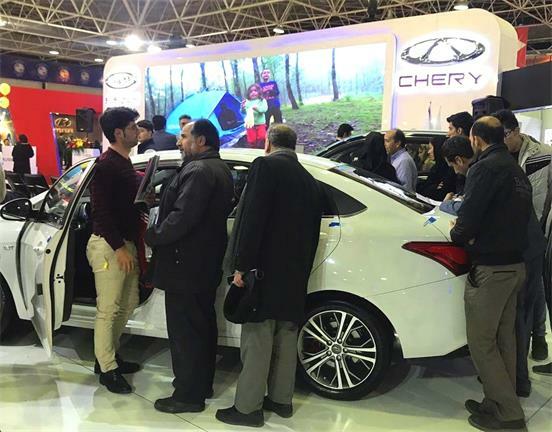 Chery Made Presence Again at Isfahan Auto Show As one of the most influential auto events in Iran, Isfahan Auto Show was kicked off on January 23 and closed on January 26. Nearly 30 international manufacturers, including BMW, Hyundai and Renault, made presence at the Auto Show. 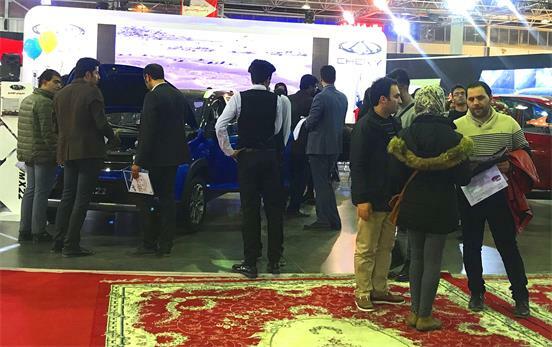 The JV Chery & MVM brought a few of its major products to the Auto Show, attracting more than 100 Iranian owners of Chery cars, dozens of mainstream media and fans of Chery Club to the stand of Chery & MVM. Isfahan Auto Show On the first day of the Auto Show, Chery organized a special cultural activity for X33(TIGGO 3) owners. 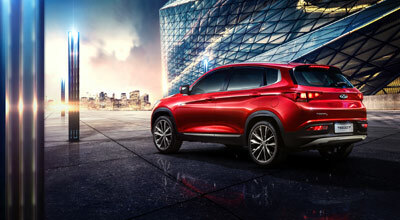 It also prepared a gift of lifelong free maintenance for the X33(TIGGO 3) owner present at the Auto Show with longest driving mileage.The gift was taken by an owner whose X33(TIGGO 3) had driven for 370,000KM. This lucky owner gave great praise for Chery brand, saying he loved his X33(TIGGO 3) very much because of its satisfying performance. It is difficult to find it is an old vehicle that has been used for years. 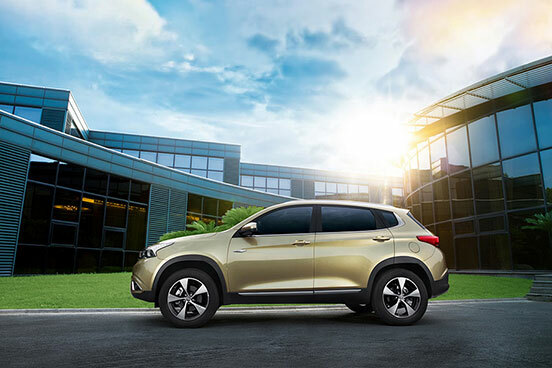 X33(TIGGO 3) is the first SUV model of Chery & MVM in Iran, and the first urban SUV product in the country. A few generations of X33(TIGGO 3) have been launched in Iran, becoming the priority choice for Iranian families. Till today, more than 1.3 million X33(TIGGO 3) units, which is an inspection-free model, have been sold in more than 80 countries and regions in the world and gained many honors and awards. the X33(TIGGO 3) Club Activity In addition to the TIGGO 7, TIGGO 5, X33(TIGGO 3), X22（TIGGO 2）and other models of traditional energy, ARRIZO 5 EV, the new energy vehicle of Chery, also made presence at the event. As the representative model of Chery’s new-energy models, ARRIZO 5 EV has the best and most advanced new-energy manufacturing technologies of Chery, representing the new orientation of Chery’s new energy automobiles. 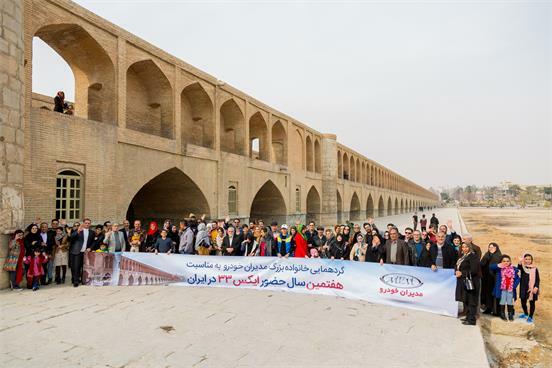 Its presence attracted the attention of many Iran media and audiences. Over the past years, Chery & MVM, according to the market demands in Iran, has launched X33(TIGGO 3), TIGGO 5, TIGGO 7, ARRIZO 5, X22（TIGGO 2）and other models, obtaining favor of Iranian users. Thanks to the excellent products, Chery & MVM brands have won trust of users and recognition in the industry. It received the Award of Best Automotive Brand at the 2012 Isfahan International Auto Show, the Best Stand Design and Best Activity Award at 2015 Meshed Auto Show, and won the First Place in Award of Excellence for Digital Automotive Marketing. 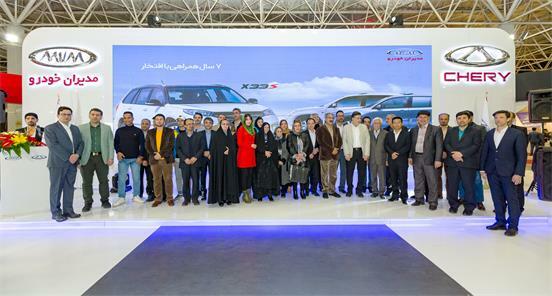 In the same year, ARRIZO 5 was given the title of Best Model in Class-A Niche Market in Iran by Donyayekhodo, the largest automotive media in Iran. Review of Chery’s Performance and Honors in Global Market in 2017 In 2017, Chery made many accomplishments in China and in the world. In March and April, it received the China Grand Award of Best Automobiles in Batch Production for 2016, and Most Favored China’s Automotive Brand in Russia, which were granted by CARSTYLING, the world top automotive journal based in Japan and specialized in automotive design, and by the famous Russian automotive media Autopanorama Magazine. In June, Chery, for the first time, sent the batch-production vehicle to 2017 TAKLIMAKAN Rally in China, presenting the exceptional performance and winning the championship. In the same month, the TIGGO family of Chery won the Gold Award for SUV Products for 2016 awarded by the famous automotive magazine Nitro in Peru, and the Best Stand Design Prize at the Guayaquil Auto Show in Ecuador. 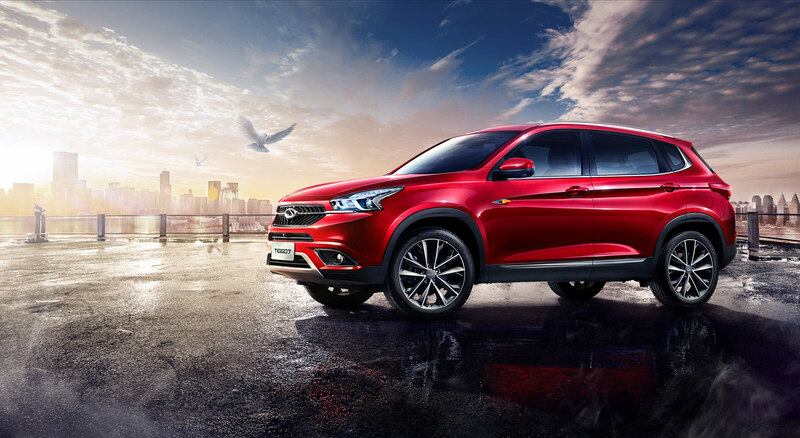 In December of last year, TIGGO2 and TIGGO7 of Chery won the Best SUV for 2018 and Best Large SUV for 2018 nominated by automotive media in Chile, proving to the world again the extraordinary power of China’s brands. Chery continued to excel in the global market. In 2017, the brand exported 107,727 units, rising by 22.3% YOY, resulting in 1.3 million units of total exports and ranking the largest passenger vehicle exporter in China for 15 years in a row. Its excellent performance in the overseas markets has made Chery a benchmark of China’s automotive brands actively involved in international competition and setting up a positive brand image. 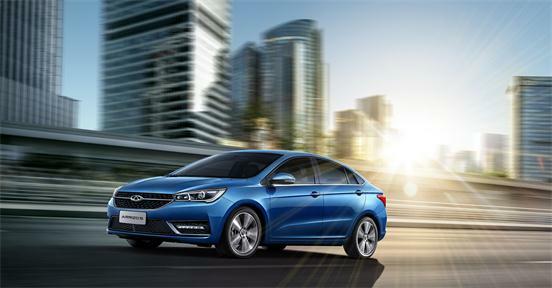 Even more, it is the result of Chery’s efforts to fulfill its global strategy, develop products and promote branding. Only those brands approaching consumers can get their trust and recognition. In 2017, Chery continued to invest more in sports marketing and digital marketing. 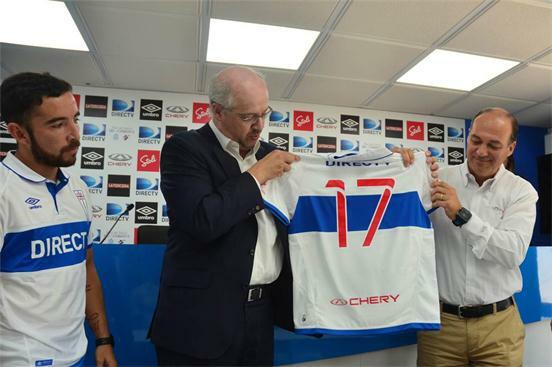 In the beginning of 2017, Chery sponsored the Club Deportivo Universidad Católica in Chile; in June, it reached strategic partnership with AFA Cup; in December, it sponsored COPA UC Chery in Chile and worked with Bein Sport, the largest sport channel in North Africa, to live broadcast La Liga. By sponsoring the sport events, in particular the football events, Chery has improved its brand fame and reputation in the overseas markets. Besides, Chery was active to use social media to interact with consumers, organizing a number of interactive activities such as Christmas Carnival, Guess Winners in FIFA World Cup Qualifiers and others. 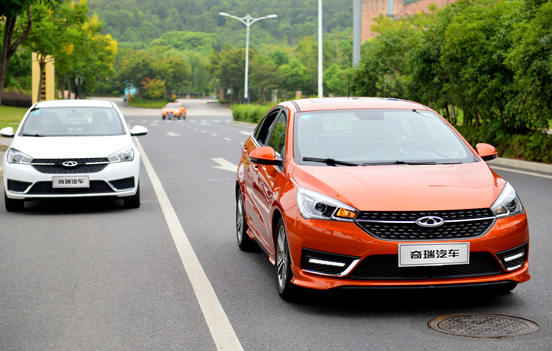 It also organized lucky Chery car owners to travel to China so as to convey Chery’s core brand value Fun to Drive to each and every overseas consumer. In recent years, Chery keeps taking the leading position in exporting its products. The brand has been deeply rooted in overseas automotive markets in product, brand, service and marketing while obtaining the product competitiveness matching the biggest automotive brands in the world. Chery now has operations in over 80 countries and regions in the world. It has established 10 overseas product facilities, and a network of nearly 1,500 dealers. Besides, Chery has more than six million global users, 1.3 of whom are overseas users. Chery has received numerous praises and upgraded strong brand influence. What the brand has achieved attributes to its excellent R&D team, in which the major members have 15+ years of experience in world-famous automotive manufacturers. Besides, Chery is also active to enroll graduates from universities, who have the spirit of innovation, who will have the opportunity to grow into the master designers of automobiles. Year 2018 marks a new start for the 21-year-old Chery. Chery will continue to be the leader in international market when its partnership with CAOA in Brazil goes deeper, Chery engineering centers in Iran, Brazil and Europe get completed or commenced, and more sport marketing campaigns are conducted in Central and South America market. In the future, Chery will adhere to making innovations. Relying on competent technologies and flexible marketing tactics, it will bring personalized products to global users and launch products with more competitiveness. At the same time, it will continue to set the pace in the international market and create the image of China brands in the overseas markets through continuous improvements, never-end pursuit for service quality and the ceaseless efforts to bring better products to overseas users. Chery's self-driving car developed with Baidu appears at CES 2018 On January 9, 2018, CES, the world's largest and most influential technology exhibition, opened in Las Vegas. Chery Arrizo 5, based on Baidu's Apollo automatic driving platform, attracted global attention. The special Arrizo 5 is a self-driving car jointly built by Chery and Baidu since the two sides forged a partnership. It is compatible with Apollo Pilot system and carries mass-produced automatic driving solutions. (Special" Arrizo 5) With the development of AI and automatic driving, world-renowned automakers and technology enterprises have chosen CES to show their automatic driving technologies in recent years. The joint appearance of Baidu and Chery at CES 2018 shows the great confidence and tremendous strength of the Chinese technology alliance. 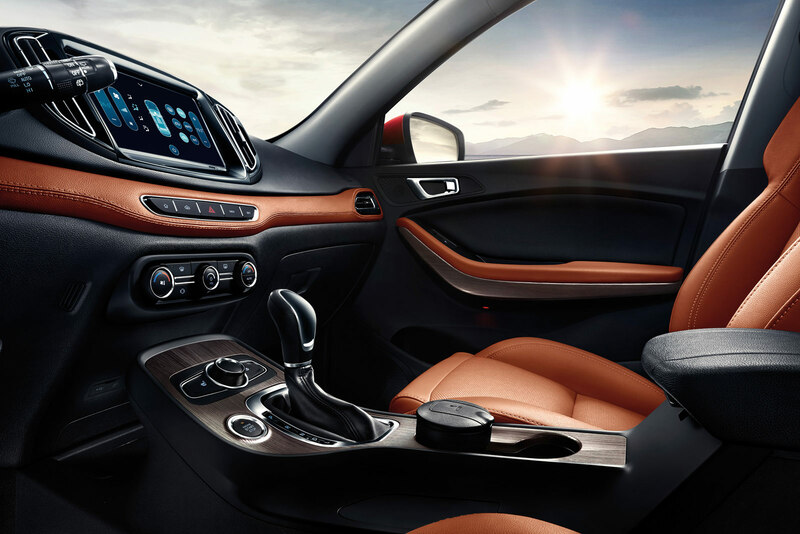 As a leading innovative Chinese independent brand, through independent innovation, Chery has achieved a breakthrough in automotive information entertainment, IOV and other core technologies, which will undoubtedly boost Chery's competitiveness in the future intelligent vehicle field. Since 2010, Chery has taken the lead in developing ICV automotive technology and established an automatic driving automotive technology platform in association with the Hefei Institutes of Physical Science, Chinese Academy of Sciences. 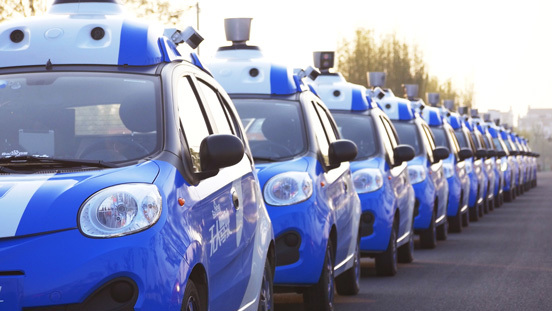 In 2016, the Wuhu Municipal People's Government joined hands with Baidu to establish the world's first "full automatic driving operation base" at Wuhu High-tech Industrial Development Zone, laying the foundation for Chery's ICV operation. Over the past seven years, Chery has developed two generations of ICVs. The third-generation ICV under development is a highly-self-driving vehicle based on Chery's EQ EV platform and with the capability of industrialization. (Road demonstration of Chery's second-generation ICV technology) Chery has mastered intelligent vehicle technologies including lane detection, millimeter-wave radar data processing, vehicle detection, local path planning and vehicle bottom control, as well as intelligent vehicle technologies including laser radar data processing, RTK data processing and map data processing. Also, Chery has achieved staged breakthroughs in more than 10 key cutting-edge technologies including AI interactive navigation, next-generation cabin system, eyeball tracking and face recognition, UBI insurance and digital marketing, and V2X (core technology of over-the-horizon detection system). 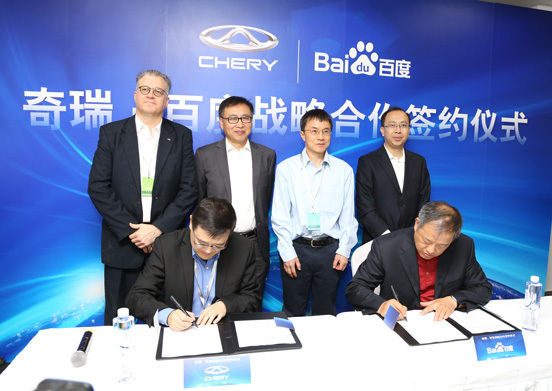 While conducting independent R&D, Chery has carried out more remarkable and fruitful strategic cooperation with Baidu in the intelligent vehicle field. 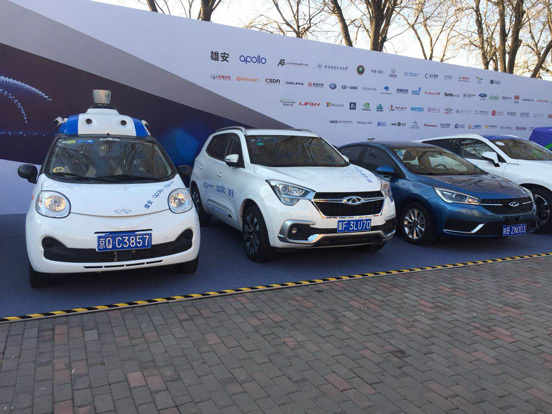 (Self-driving cars jointly developed by Baidu and Chery) At the World Internet Conference held in Wuzhen, Zhejiang Province in November 2016, eQ self-driving car, jointly developed by Chery and Baidu, went into trial operation on an open urban road for the first time in China. 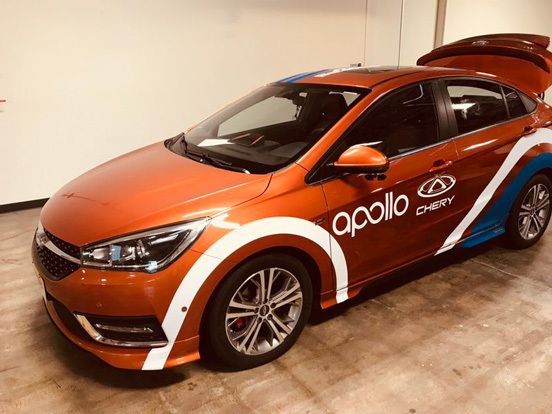 As a core member of Baidu's Apollo plan, Chery can rapidly acquire Baidu's AI technology; and Chery's mature vehicle technologies, precise development process, integral industry chain and perfect sales service system have made Chery and Baidu the strongest technology alliance in China. (Chery's three self-driving cars selected into the "national team") Automotive AI is undoubtedly promising. Just as Apple subverted traditional mobile phones, automatic driving will subvert traditional cars. With the deepening of the cooperation, the two sides will carry out all-round cooperation in fields including IOV, highly automatic driving and self driving, to bring about dramatic changes to the automotive field. This June Chery and Baidu signed an MOU on strategic cooperation in the Silicon Valley, and planned to establish "Chery Silicon Valley Research Institute". This will further boost the development of core ICV technologies and lay a solid technical foundation for Chery to develop the global market. According to the plan, Chery will launch an ICV developed with Baidu in 2018, and the self-driving car jointly developed by the two sides will go into mass production in 2020. Scene of the signing ceremony between Chery and Baidu) During CES 2018, a mysterious fleet of self-driving cars took California Highway and was open for examination. In the automatic driving field, California Self-driving Test Base should not be strange to you. Only 45 companies in the world have been qualified for road rests here since 2014, including 14 companies with Chinese investment or background (accounting for 31 percent), less than 19 U.S. companies only. 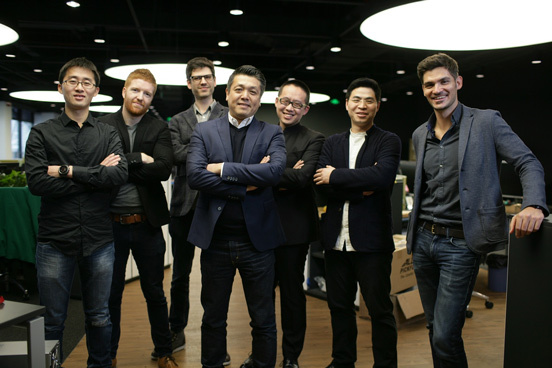 As a Chinese AI and automatic driving force, Chery is registering an automatic driving development company (Leonis Technologies North America) in the Silicon Valley to be engaged in big data research, self driving technology R&D and road tests in California. After successful registration, Chery will apply for the qualification for road tests in California, "China's AI and automatic driving are attracting growing attention from the Silicon Valley and the world". Intelligent connection has always been a major strategic focus of Chery. Through CES 2018, Chery has showed the world the results of its innovative cooperation with Baidu, as well as its forward-looking automatic driving technologies. Chery will participate in CES 2019 to present more advanced automatic driving technologies. We will work hard to achieve the ultimate goal of automatic driving to lay the groundwork for creating a safer, more efficient and economical new travel lifestyle for the human society. Chery leading in export, with year-on-year growth at 22.3% As an overseas business card of Chinese automobile, Chery has rooted, regardless of products, brand, service and marketing, into the overseas markets, covering over 80 countries and regions, building 10 overseas production bases and 1,500 sales and service networks, and serving over 6,000,000 users throughout the world. Chery has enhanced its brand influence greatly and won good reputation. Recently, Chery disclosed its export results in 2017: annual export volume of 107,727 vehicles, with year-on-year growth at 22.3%. So far, Chery has exported at least 1,300,000 vehicles, keeping its leading position domestically. 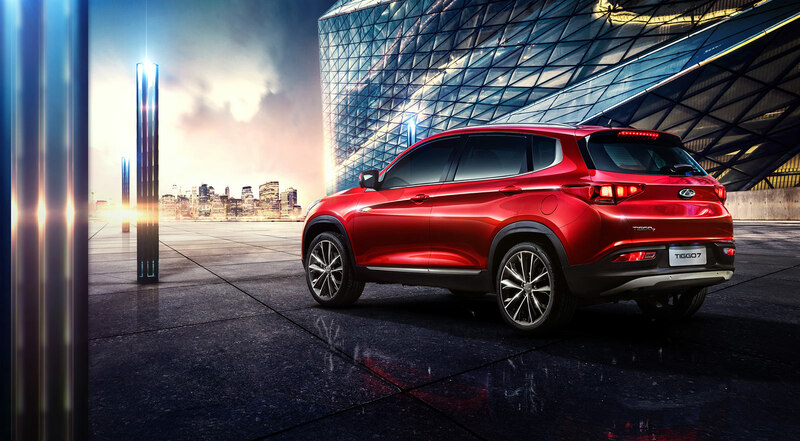 Chery’s overseas performance is a benchmark for Chinese automobile brands to take an active part in international competition and build brand influence, as well as the results for Chery to practice its global strategy, forage its products and deepen its brand. Since its inception, Chery brand has determined “internationalization” as one of its core strategies. From the exploration of international trade to the overseas marketing, from “going-out”, “going-into” to “going-up”, Chery has been committed to being a globally-competitive international automobile brand. In September 2017, Chery made its debut in the Frankfurt Motor Show, and launched its brand-new high-end product family EXEED and its first model EXEED TX, which won good reputation from overseas media, and accelerated the realization of strategic target. With the enhancement of Chery’s product hard power and brand reputation, Chery announced its “WWW+ Strategy” (World Wide Wisdom, Win-Win, Wired) in November in China, which will bring global users infinite possibilities through keeping innovating sustainably and advancing with the times. Chery has entered such overseas markets as Asia, Europe, Africa and Latin America. Based on its product strength and brand marketing, Chery has the ability to compete with international brands directly. 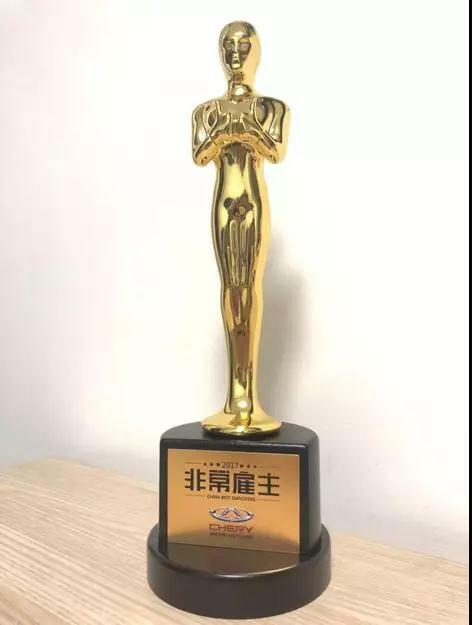 In terms of the brand construction, Chery has been awarded “World's Most Admired Companies” by Fortune Magazine, "Best Market Performance Award” in Belgrade International Motor Show, and “Most Popular Chinese Automobile Brands” in two consecutive years in Russia. 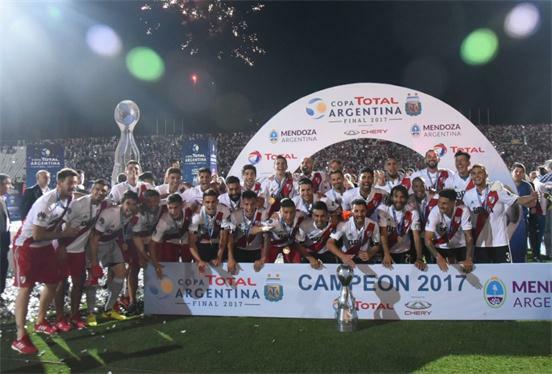 In 2017, Chery sponsored some sports events in Chile, Argentina, etc., cooperated with the North Africa’s largest sports channel Bein Sport to perform the live-broadcasting of Spanish Primera Liga, supported Iran’s education and public welfare establishments, provided wedding vehicles for young couples freely, funded poor, sick and drop-out children, and organized overseas auto owners to travel in China, which greatly enhanced Chery’s brand influence, brand awareness and brand reputation. In terms of the product layout, Chery has built the sedan and SUV product family based on ARRIZO and TIGGO, which are favored by overseas users. Globally strategic vehicle model TIGGO 7 has been launched in Iran, Chile and UAE this year. In January, its sales volume and orders were well-performed. In March, TIGGO 7 was awarded “The Best Production Car Design China 2016” by Japan’s globally top-level authoritative automobile modeling design journal CARSTYLING. In June, TIGGO 7 won the champion in China Around Taklimakan Rally. In December, Chery’s TIGGO 7 fleet won the triple crown in 2017 Chinese Circuit Offroad Championship (COC). Chery’s youth-oriented brand-new SUV TIGGO 2 has been launched in Chile, Peru, Iran, Russia, etc. in 2017. Based on its precision product positioning and the focus of consumers experience, the overseas sales volume of TIGGO 2 within the three months was very eye-catching, up to nearly 10,000 vehicles, and has been kept growing rapidly. Its quality strength has been proofed by the word of mouth and market. 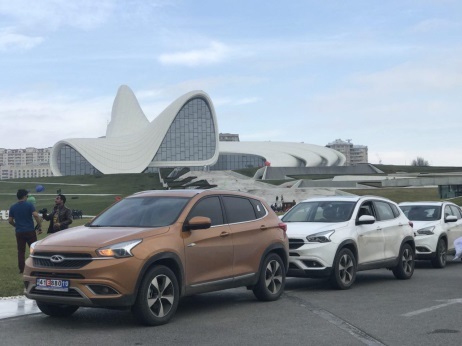 TIGGO 7 and TIGGO 2 were awarded “2018 Best Big SUV” and “2018 Best SUV” by Chile’s specialized automobile media in December respectively. In 2018, with the all-round performance of Brazil CAOA cooperation, the continuation of sports marketing in Central & South America, and the expansion of Iran, Brazil and Europe engineering centers, Chery will accelerate the implementation of strategy to make more contribution to the construction of automobile industry of overseas key markets. The future is an era of intelligentization and high quality. Chery will, through flexible diversified brand marketing, invest in more competitive and personalized products, and constantly upgrade service networks and service quality to bring overseas users convenient comfortable life, and become a booster of global automobile industry chain. THE FEATURE-PACKED FASHIONABLE SUV IS CHERY’S NEW FLAGSHIP THAT FLAUNTS A DYNAMIC APPEARANCE, SUPERB CONTROL AND OUTSTANDING QUALITY. Building on the success of the highly popular Chery Tiggo 5, the trend setting SUV which has been received well in the UAE, Al Habtoor Motors-Chery UAE brings in the next generation stylish Tiggo 7, packed with never-before features. The all-new Tiggo 7 sets a new benchmark in the Chery SUV line-up with a clear departure from the conservative lines of previous models. The Tiggo 7 is also the first Chery to have the new family face with a typical wavy grille and boomerang headlights. Aimed at the young and fashionable, Tiggo 7 sports a futuristic and forward-looking design. Its sporty H.D.S hydrodynamic body is inspired by hydropower with water streamed body lines that capture the momentum to move forward. The double arched wavy front face adds an elegant touch, while its Xenon headlamp shaped as the legendary Trident of Poseidon blends fashionable looks with the tough SUV character. The Xenon headlamps emit lights four times higher in intensity with one-third less energy consumption when compared to conventional halogen lamps. The striking angular tiger-claw taillights feature high charging speed and long service life. 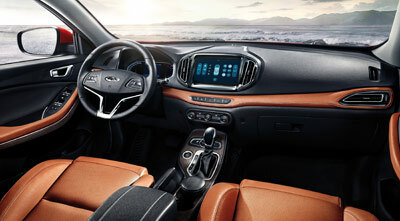 Moving to the inside, the new SUV features a rich dual colour interior trim with a stylish wing-shaped centre console dashboard which conveys a sense of power. The 9-inch True-color HD Capacitive Touch Screen includes Multi-media Features, A/C Settings, and Vehicle Settings that offers the driver easy, simple and user-friendly interactive experience. There's also a 4.8-inch Color LCD Dashboard which offers a user-friendly interface, with interactive dual-screen display between the audio screen and the dashboard. For added convenience, the all-new Tiggo 7 sports Keyless Entry as well as a One-button Start System. The vehicle can be locked and unlocked simply by pressing the button on the handle outside the driver's door. 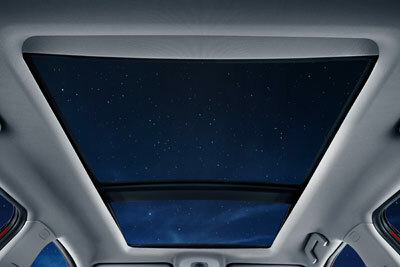 The large-sized 0.92 ㎡ Panoramic Sunroof with electric sunblind, may be fully opened or tipped up to keep fresh air circulated naturally, creates a comfortable ambiance inside to enjoy the fantastic landscape outside. When it comes to power, the Tiggo 7 comes to life with a choice of an all-new highly-efficient 1.5L turbocharged engine or a 2.0-DVVT Naturally Aspirated Engine which delivers superior power and fuel economy. Mated to a GETRAG 6-Speed Transverse Dry Dual Clutch Transmission for direct power output, higher transmission efficiency, and quicker shifting response, the transmission promises excellent fuel-efficiency and durability. Built on an independent multi-link rear suspension and sub frame structure, it significantly enhances the stability when changing tracks and turning at high speeds, as well as it effectively prevents vibration and noise to offer greater driving pleasure and riding comfort. When it comes to smart safety features, the 360° Full-time Panoramic Camera System gives the driver the choice to easily switch between the panorama view and the independent views from four cameras. This in turn allows real-time control of the surroundings, minimizing the blind zones while driving and parking. Furthermore, for a clear view behind, the Tiggo 7 is armed with a high-definition Visualized Reverse Imaging and All-dimensional Eight-probe Radar. 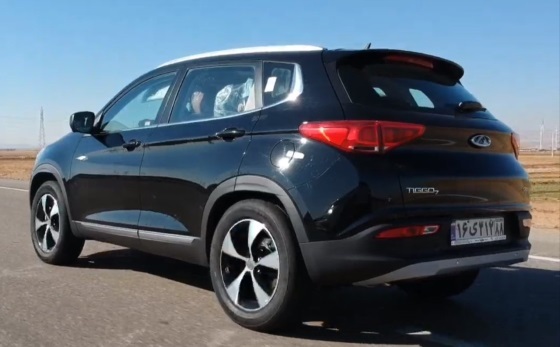 Designed in accordance with the highest crash safety rating of C-NCAP five-star standard, the Tiggo 7 provides five-star safety protection for occupants. What's more, BOSCH ESP 9.1 comes as a standard in all variants to ensure the best stability and accurate steering performance, while integrating features like ABS, EBD and TCS for guaranteed safety. All-round protection for driver and passengers is enabled by 6 Airbags and an Integral Cage Body Comprising Benteler - ultra-high-strength hot-formed steel which is used in 6 key areas and enhances bending rigidity up to 21000Nm/°. The Hill-start Hold Control (HHC), Tire Pressure Monitoring System (TPMS) and 100-0km/h Braking Distance of 39.70m all work hand in hand to offer a safer and confident drive for all. The wide leather seats, dual-zone automatic air conditioning, cabin noise control measures and class-leading rear compartment space all help in delivering VIP-level riding experience. "Innovation has been the hallmark of the success of Chery worldwide. The designs are influenced by Chery's profound understanding of consumer preferences, cultural backgrounds and market trends. This level of in-depth understanding and innovative thinking will definitely give the all-new Tiggo 7 a decisive edge. Going by the success of Tiggo 5, we are sure to recreate the magic at a larger scale.” said Mr. Geoff Dowding, the COO of Al Habtoor Motors.